Ghetto Film School (GFS) is an award-winning nonprofit founded in 2000 to educate, develop and celebrate the next generation of American storytellers. The school looks for young talent from local communities and provides them with access, opportunity, and resources to pursue creative careers. They are located in New York City and Los Angeles, and serve annually over 3,000 individuals ages 14-34, equipping them for top universities and careers in the creative industries through two tracks: an introductory education program for high school students and early-career support for alumni and young professionals. In LA County the school provides over 1,000 hours of free hands-on experience and rigorous instruction in cinematic storytelling and production training to 130 diverse high school students - including guest lessons from industry leaders like Halle Berry, Stephen Caple Jr., and Ryan Coogler. Second-year students complete courses in “episodic storytelling”, which focuses on both serial and episodic storytelling on television. This year teams of students pitched pilot concepts with accompanying sizzle reels to Snowfall showrunners and FX Networks executives who provided feedback and chose three projects to move to production. As students developed and shot their three-five-minute pilots, FX Networks provided them with a Snowfall writer's room experience. In Spring of 2018 third-year students premiered Charley Horse – the International Thesis Project they shot last summer in Tel Aviv, Israel – at The Landmark. Dakota Johnson hosted the event. This real-world production experience provided students with 160 total hours of in-class instruction and a 10-day trip to Israel to produce a short film with a local cast and mentoring crew 30 new students from across LA County started GFS in late June. 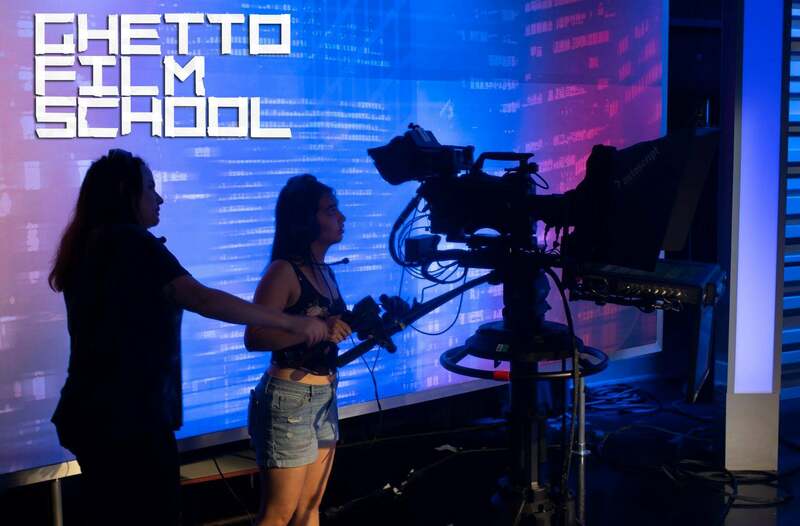 First-year students learn the fundamentals of filmmaking in their eight-week summer immersion that includes studio tours, set visits, and guest lectures from top filmmakers and industry experts. Guests this summer have included Betsy Beers (Partner and Producer, Shondaland), Alejandro González Iñárritu (The Revenant), and Stacey Snider (Chairman & CEO, 20th Century Fox Film). These first-year students pitched their six-minute non-dialogue films at Fox Studios to an industry panel that included producers and development executives from Black Bicycle Entertainment, Curb Your Enthusiasm, HBO, and RYOT. The top ten films (self-selected by students) will screen at a September event at The Landmark. With the support of the Hollywood Foreign Press Association, Ghetto Film School (GFS) has achieved a number of major accomplishments. In their flagship initiative, the Fellows Program, a 30-month visual storytelling course for high school students, fellows receive more than 1,000 hours of immersive, college-level training from leading filmmakers and industry professionals, learning both the art and business of storytelling while getting the preparation and guidance to advance their education at top universities. Students are selected through an application process based on demonstrated storytelling talent and creative ambition. Tuition is always free of charge.